Spherical Plain Bearing The GEEW.ES Series is a plain bearing consisting of an inner ring with a spherical outer surface and an outer ring with a spherical inner surface that accommodates the inner ring and can withstand large loads. Spherical Plain Bearing The GEEW.ES Series is a plain bearing consisting of an inner ring with a spherical outer surface and an outer ring with a spherical inner surface that accommodates the inner ring and can withstand large loads. It is commonly used in automotive traction equipment, medical machinery equipment and construction machinery equipment. 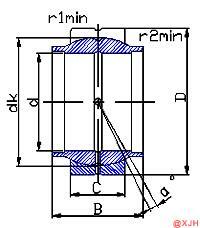 During use, due to the needs of the equipment, both ends of the joint bearing can be rotated. Spherical Plain Bearing GEEW.ES Series is based on the type, size, tolerance, clearance of the bearing, the working condition of the bearing, the size, direction and nature of the load on the bearing, the material of the shaft and the housing hole, and the ease of assembly and disassembly. Choice of fit with the shaft and housing bore. The oscillating ferrule of the bearing generally adopts an interference fit, so that when the bearing is under load, the ferrule does not wear and rotate relatively on the mating surface of the shaft and the housing hole.